The genius of Nancy Bush unfolds in another pair of socks. Stripy heels and toes, calf shaping, and a gentle texture. 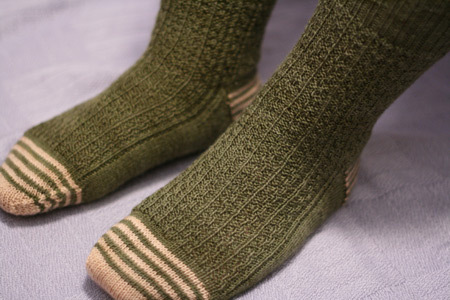 Pattern: Gentleman’s Sock in Railway Stitch from Nancy Bush’s Knitting Vintage Socks . I didn’t change anything significant about the pattern – worked the foot over more stitches and knit a more blunt toe. Yarn: Lorna’s Laces Shepherd Sock in cedar, 2 skeins. For the contrast I used Lorna’s Laces in chino, leftover from my dad’s socks (as usual, I visited Linda to scratch that Lorna’s itch). 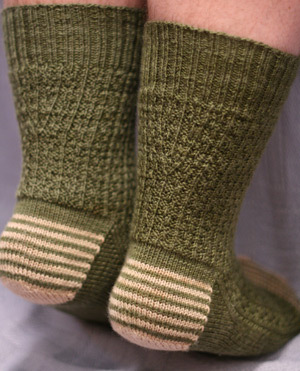 Nancy Bush does it for a fifth time: Gentleman’s Socks in Railway Stitch join these other KVS beauties: Child’s First Sock in Shell Pattern, Gentleman’s Fancy Socks, Gentleman’s Sock with Lozenge Pattern, and Yarrow Ribbed Sock. And Lorna’s Laces never lets me down – watching the subtle variegation keeps me entertained each and every time. You’re rockin’ those socks, Miss Kathy! Another outstanding job. Very nice! I love the little gusset at the calf and those heels and toes make me smile. Very nice indeed! I love the subtle shaping towards the calf. Helps to reduce the “scrunchy” and “slouchy” tendency of a normal sock. I’m really impressed with your work. What a handsome pair of socks. I like the striped toes & heels very much. Beautiful work, as always. I especially like the striped heels and toes. Love those! The two colorways work well together – love those toes and heels. Beautifully done. I especially like the calf shaping. I’d already marked these socks as something that my dad would like – and now I’d like a pair as well :). Beautiful socks! I love Nancy Bush’s patterns; they always work, and I always learn a lot. I wasn’t sure about the calf shaping from the pics in the book, but it looks great here! Inspiring as always. Thanks for sharing them with us. Very nice! I love the contrast bands to jazz up the plain areas. I love these socks! Beautiful work, Kathy! Such a lovely pair of socks – really love them! As I have been reading your blog for sometime & know that you are a great fan of Lorna Laces & will like to seek your advice. I just knitted 1 Jaywalker (thanks for the pattern) using Lorna Laces & the colors pooled. Check my blog for pics of the sock. Will love to hear what you think. Thanks & Happy Sock Knitting! And to think I actually considered making those without striped heels and toes. Thank you for showing me the error of my ways! Those look great! Beautiful. Love the heels and toes. Wonderful socks. The contrast yarn is a lovely touch. Great job! gorgeous socks! i enjoyed this pattern lots, too. my husband loves this pair, his favorite handknit socks so far. Very cute and stripy. Nice job! Love that pattern and the shade of green! Wonderful color choices for those socks! I made these a few mos back but misread the railway stitch pattern, modified the heel and accidentally forgot the toe stripes. Seeing yours makes me want to knit from the book! BTW, I just finished some Canal du Midi socks. I never would have tried them if it hadn’t been for your photos. The model in the book does nothing for that sock pattern! Thanks! gorgeous. a total work of art. Those are SOME beautiful socks. I want ’em!!!! These make me want to learn how to knit socks! the striped heel and toe really compliment the overall design. i love that touch! Wonderful socks! I agree, Nancy Bush’s patterns are great. Your pictures make me want to knit socks full time! I really like that striped heel. That’s an idea I just might add into my SIP right now. Your photography is excellent. It’s always a pleasure to visit your blog. I like them as well. I have the book, and tried knitting one of the patterns, however I let someone else substitute yarn, and it wasn’t a good choice. You have made me want to revisit that book. Great socks, Kathy! Nancy Bush never lets us down 🙂 It is interesting to see the shaping on the back of this pattern… not quite calf shaping… is is Achilles tendon shaping? 🙂 Looks great. Those are very handsome socks indeed! You’ve sold me. I have to buy the book! I just hope it comes with your knitting skills. These are just adorable (can you say that about “gentleman’s socks?). I love them and they make me smile, too. Once again, AMAZING socks. You are so fast! How long does it take you to knit a pair of socks? I love how you can make us think that you’re putting all your effort into one craft indulgence, but are working coughcrankingcough so hard off what is mentioned on the blog. Last time I checked, you were on the heel of the FIRST sock! I don’t know how you balance your workload so well. As usual, I’m impressed with your work! Those look grand, and your photos show them off to perfection. I’ll have to take another look at that pattern. I really like how you interpreted it. And I love your little quilted squares. Tres cool! Those stripes are so very dapper. Yes she is a genius and you make the genius reality with such panache! You are well on your way to a Nancy Bush master study. Lovely, clear work. Yeah, that calf shaping is FAB! These are really great socks. I would love to try these for my son, who’s four. They’re just great with the striped heel and toe. Wow. Wow. Those are beautiful socks. What a great choice of colors. You know I have that book and I totally ignored that pattern. I am going to have to give it another look. I have knit several socks from the book and really like Nancy Bush’s books because I learn so much from them. very cute! i like the striping detail. gorgeous work, I think I need to pick this book up. I freaking LOVE those stripes!!!! Yet another pair of great socks! The railway stitch is gorgeous, and I love the heels, particularly the way the stripes emphasize the structural line of the picked-up edges. Thank you! I had been knitting and frogging a pair of socks from STR yarn all weekend because I didn’t like the way they were striping. Thanks to the link to your STR Yarrow Ribbed Socks I have finally found a stitch count and pattern which allows the colours to blend evenly. Perhaps 54 stitches is the magic number for STR lightweight. Your new socks are great, too and I agree, Nancy Bush’s sock books are the best. Absolutely beautiful socks! I love the striped heals and toes. So pretty! I love the stripes. So unexpected.